One day I woke up and decided I had to have falafel. Falafel are deep-fried balls of pulsed chickpeas blended with herbs, onion and garlic. Sometimes they are made with a combination of broad beans and chickpeas and sometimes that contain a lot of herbs which make them rather green on the inside. They’re so tasty and a great high-protein, vegetarian food that you can eat in a sandwich or on a salad or dipped into a sauce. My family and I love falafel and one day I just had such a craving for them. I wanted the works — pita bread, tahini sauce, lettuce, tomato and pickled radishes. But the fact that falafel are deep-fried is a major turn-off to me, especially food that is deep-fried in a restaurant, as opposed to at my house, because restaurants use and re-use the same low-quality oil over and over again. Deep-fried foods are just a big plate of inflammation, bad for digestion, bad for the heart, bad for the blood, bad for the skin, just B.A.D. Knowing how awful deep-fried foods are is a little bit of a curse because it’s hard for me to enjoy them, even in moderation. But I wanted to make real, authentic falafel that I would un-authetically bake. So naturally I went on Youtube to learn how to make them. 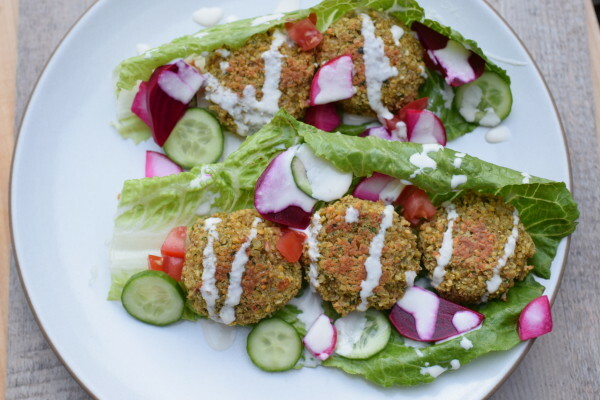 Sure there are plenty of blogs with falafel recipes, but a lot of these recipes are not the real deal. For the real deal, I watched falafel-making videos from Israel and I learned everything I needed to know and then some! For example, falafel are made with raw, soaked chickpeas, not canned. The texture is a bit crumbly, not a mashed potato patty. There are no eggs in falafel. 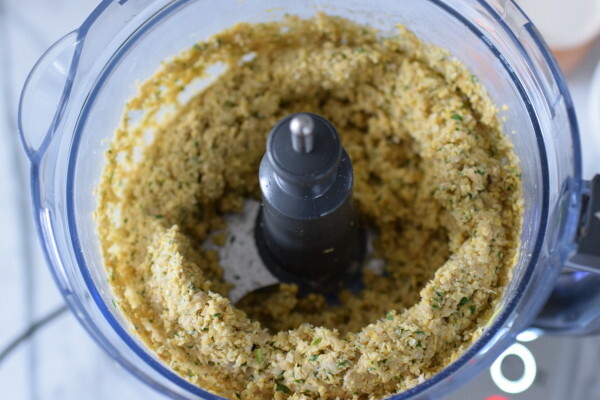 And after watching a few videos of expert falafel-makers, I really wished I had a meat grinder (which is what most of them use) to process the all the ingredients into the perfect texture. But my food processor was good enough and the next day (because I let my chickpeas soak 24 hours), we enjoyed very delicious, healthy baked falafel. And although falafel has a bit of oiliness from frying, I didn’t even notice the absence of oil since I smothered the patties with a delicious tahini sauce. My son, who is known to be a tad picky, devours anywhere from 6-10 falafel at dinner when I make them. For sure he loves to eat them in pita, especially if the pita is homemade and warm from the oven (I used this Martha Stewart Living recipe with success.) But he (and we) is just as happy wrapping a few falafel in a big lettuce leaf with some sauce. 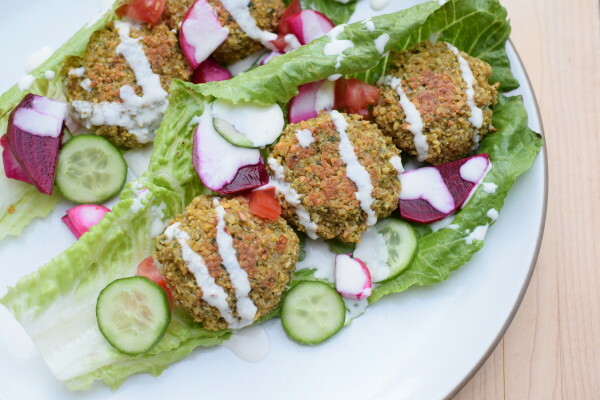 Falafel make the perfect Meatless Monday dinner since they contain lots of protein from the chickpeas and the tahini sauce. You can also make them spicier with an extra pinch of cayenne. If I know I’m going to have a crazy afternoon, I’ll make the sauce and shape the falafel in the morning and bake them at the end of the day for a really easy dinner. Add some lettuce and tomatoes for a simple dinner or go the extra mile with pickled vegetables, pita, and some grilled eggplant. 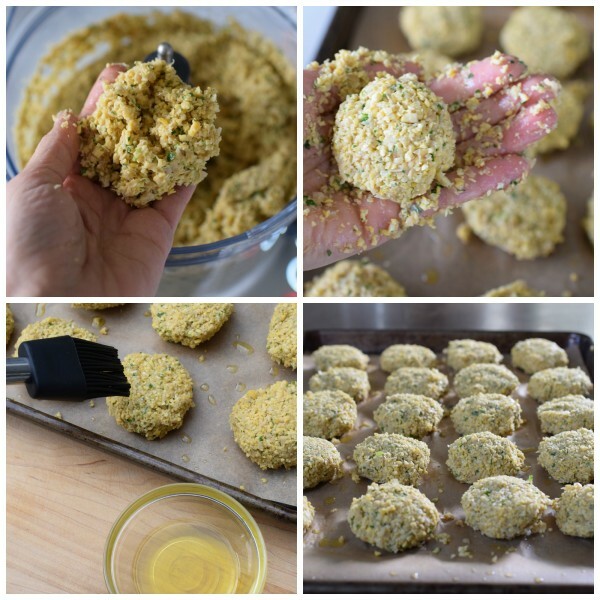 Even though I am really against deep frying and I had great results baking these, you can certainly “sauté” these falafel in a skillet with some olive oil until golden and crisp on both sides. It is a much faster way to cook these and they will have a little bit more of an authentic greasiness. But the baked version does it for me just fine. I hope you’ll give them a try! 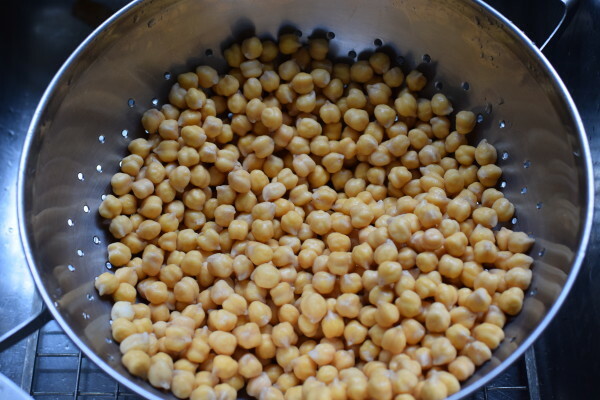 Put dried chickpeas in a bowl and cover with water by a few inches. Soak 12-24 hours, making sure chickpeas stay completely submerged in water the entire time. Preheat oven to 375 degrees. Line a baking sheet with unbleached parchment paper and grease the paper with olive oil. 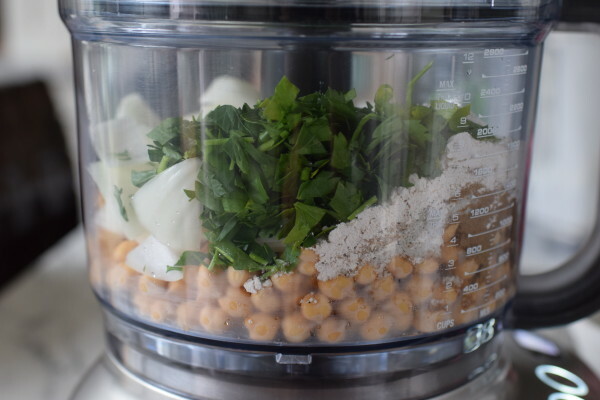 Drain the chickpeas, and add to a food processor with garlic, onion, spices, salt and pepper, baking soda, lemon juice, parsley and flour. (Use a meat grinder if you have one.) Pulse the mixture, scraping down the sides as necessary, until it looks like couscous. The mixture will be quite crumbly. Form the mixture into about 20 balls, 1 ½ inches each. Press down on the tops to flatten them into thick patties. You can add a little extra flour if they are not holding together. Place them on the prepared baking sheet. Brush the tops with oil. Blend all the sauce ingredients in a blender adjusting water to achieve right consistency. You want a thin sauce. 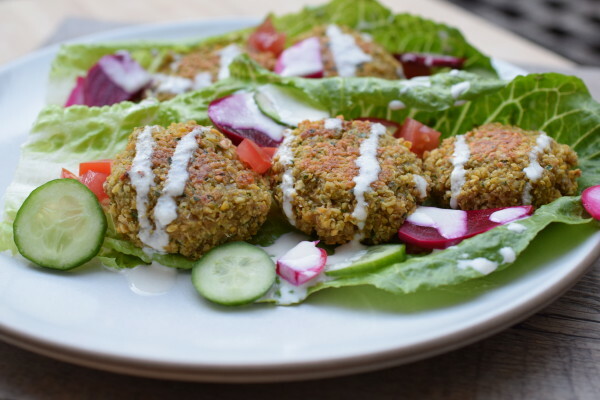 Serve falafel with tahini sauce in a pita or lettuce leaves. Chopped tomato and cucumber salad is a nice accompaniment. Pamela I have a massive amount of baked chickpeas from another recipe- can I use them here? Not bad, right? Just not authentic and once you’ve had the real way with uncooked, soaked chickpeas, it’s hard to to the cooked ones. Thanks for letting me know! I forgot to measure my chickpeas before soaking. Any idea how much soaked chickpeas I should use? Thank you! Shoot. I really don’t. 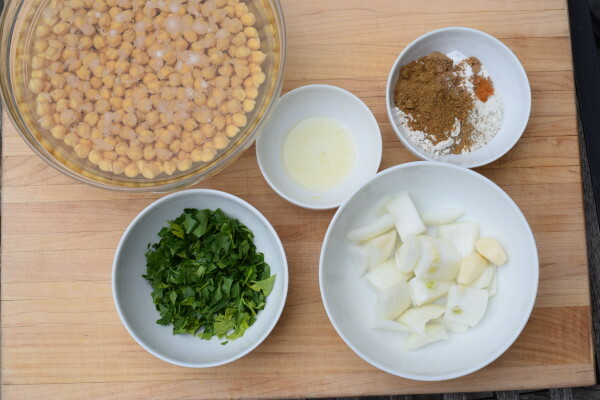 Typically, 1 cup of dried chickpeas will yield 3 cups cooked. So I might assume they would yield the same soaked/uncooked. That’s the best I can do, sorry! Made these last night and everyone loved them… even baked! Thanks for sharing. I just made these for tonight’s dinner and they are delicious! My only glitch was no matter how much warm water I added to the tahini sauce it never thinned out. I added more lemon juice too, but no dice. It’s more like th consistency of creme fraiche, but it tastes great. Now I’m off to prep for my crock pot chicken dish for tomorrow! Thanks for a fun week of new ideas! You must have had a pretty thick tahini! Keep adding water until you get the consistency you want. I just made a batch of these for tonights’s dinner and l flattened a couple and pan sauteed … served over salad with your tahini recipe for a quick lunch. They are absolutely delicious!!! Also, I have a meat grinder attachment for my Kitchenaid mixer that I only use once a year to make filling for “hamentachen” cookies. The texture is just perfect. And by putting all the vegetables in there with the chickpeas, it had ideal texture and it was VERY easy to work with. Not as quick as a food processor, but really impressive. Thanks for a great recipe. I think my family will love dinner tonight! I’m so excited to make these! One question: which recipe did you use to pickle the beets and radishes? That picture you have posted looks so yummy, and I think adding those pickled veggies will be perfect! I used the recipe from the May 2015 Martha Stewart Living Magazine. It can also be found online here: http://www.marthastewart.com/1114732/quick-pickled-radishes-and-beets Enjoy! These look great! My food processor is temporarily in storage. Do you think I could make these in my Vitamix? The vitamix tends to overprocess on the bottom. I can’t say for sure, but you could give it a try in small batches. Just don’t make hummus!